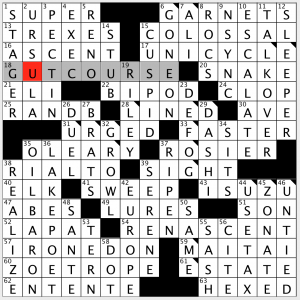 I’m about six puzzles into the Puzzles for Progress pack (currently wrestling with Patrick Berry’s “Idiot Boxes” variety-grid puzzle), and I’m loving these crosswords and variety puzzles! Top-notch puzzles … plus some snark. They’re yours in return for a $10+ donation to ACLU, PP, SPLC, NAACP, CAIR, or another of the designated organizations. In the first week, almost 500 people chipped in over $24,000 to charity! Visit Francis’s site for links and more details. Easy for a Saturday NYT for y’all too, or no? I did see over on Twitter that Austin blazed through it much faster than his Saturday average. I do like the islands and peninsulas of black squares in the grid, allowing a really smooth flow among the sections. And I like the fill! 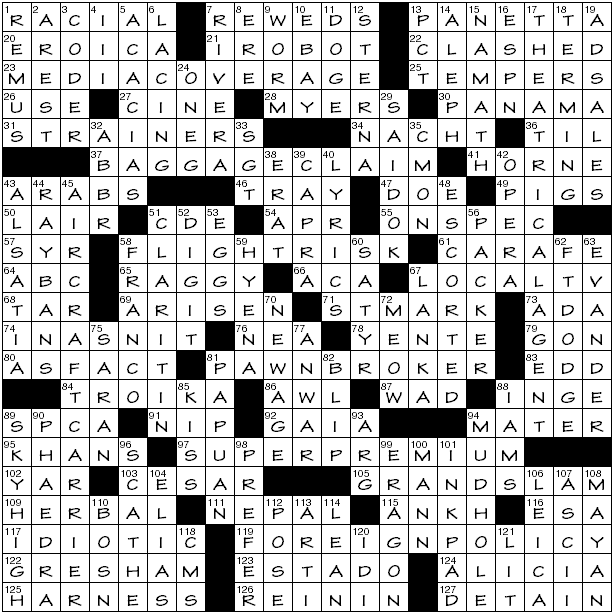 I like how JANE EYRE, OPEN DOORS, and HE GOT GAME (which I filled in with a few crossings without even reading the clue) are pancaked together at the top. JAZZ HANDS is great, I like PERONI beer (if you think it’s the Bud Light of European beers or something, I’ll thank you to keep that to yourself), and JAZZ HANDS, and a BANG-UP JOB. SUPERHERO‘s sandwiched between a SPIDER phrase and (RED) ROBIN, making me think of Spider-Man and Batman & Robin. 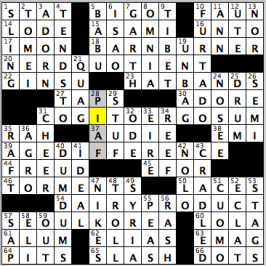 BAD JOKE is a definite thing, though I’m not sure it 100% passes muster as crossword fill. SUBZERO can bite me, unless you’re going to clue it as the appliance brand. ACHILLES, HANGING ON, YOGURT, BON JOVI … good stuff. I had to look up the 6d. [“Steel-driving man” of African-American lore], JOHN HENRY (familiar from 1970s grade school, of course), to make sure his story wasn’t a now-disavowed legend. Wow, this essay, “To Die For: Decoding John Henry,” unpacks a lot of the levels. The black body, supposedly superhuman strength in black men, capitalism’s destruction of Henry’s life, and more. 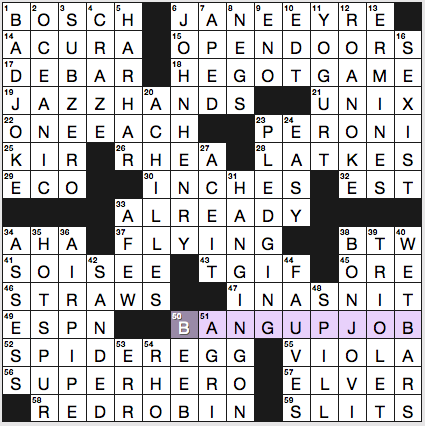 I love this clue: 30a. [ʺ], INCHES. Enclose that clue in square brackets and it looks like a frightened ghost. ONE EACH, ELVER, and DEBAR are mighty meh. 28a. [Dish often served with applesauce], LATKES. I grew up watching The Brady Bunch, so I wanted PORK CHOPS to fit in here. 35d. [Impetuous person], HOTSPUR. Also a character in Henry IV, Part I and part of a Premier League team name (Tottenham Hotspur). The team’s emblem is a cockerel atop an odd-looking soccer ball, per Wikipedia. The ol’ Tottenham Hotspur cockerel, that’s right. 8d. [Sources of prints, for short], NEGS, short for negatives. I’m grateful that this isn’t clued as the verb used in loathesome “pickup artist” lingo. I confess, the prospect of a crossword theme based on insurance both (a) sounds sooo Wallstreetjournaly, and (b) seems as if it will be pretty dry. But lo, it was good, enjoyable. Basically, familiar phrases are recast as relating to the insurance industry. 23a. [Insurance for a broadcast organization?] MEDIA COVERAGE. 37a. [Request for an insurance payout for lost luggage?] BAGGAGE CLAIM. 58a. [Concern of a pilot’s insurer?] FLIGHT RISK. 81a. [Insurance dealer to a chess player?] PAWN BROKER. 97a. [Fabulous insurance payment?] SUPER PREMIUM. 119a. [Overseas insurance?] FOREIGN POLICY. 17d. [Broadway insurance dealer?] THEATRICAL AGENT. 45a. [Boeing’s insurer?] AIRCRAFT CARRIER. Second, arguably third, aviation-related themer. Let’s do a film run-through! 27a [Cannes subject] CINÉ, 28a [Mike of “Austin Powers”] MYERS, 103a [Oscar’s French equivalent] CÉSAR, 39d [“Pocketful of Miracles” director] CAPRA, 58d [James of “Pineapple Express”] FRANCO, 59d [Shenzi, Banzai or Ed, in “The Lion King”] HYENA (dupe with 83a [Outfielder Roush in the Hall of Fame] EDD?). There are also a fair number that are a step or two removed (e.g., 21a [Nine-story collection by Isaac Asimov] I, ROBOT, 78a [Musical matchmaker] YENTE, 88a [“Picnic” playwright] INGE). 9d [Tequila bottle item] WORM. That’s mezcal—produced from a different kind of agave—and technically it’s moth larva. 47a [Female fawn] DOE; correct, but we normally think of does as being adults or juveniles, rather than fawns, which are typically considered to be very young individuals—so it’s a bit confusing. 7d [Best saver in baseball history] Mariano RIVERA. His IRA numbers are SKY HIGH (89d). 11d [Venetian magistrate] DOGE, 71a [Venice’s patron] ST MARK, 100d [“Death in Venice” author] MANN. 93d [Uru. neighbor] ARG, 30a [Colombia neighbor] PANAMA. 51a [Three after B] CDE, 64a [Exemplar of easiness] ABC. 125a [Control] HARNESS, 126a [Control] REIN IN, 84a [Three-person team] TROIKA. 14d [Beth’s predecessor] ALEPH, the second-eldest March sister. 1a [Like some profilig] RACIAL, 25a [Some are short] TEMPERS, 54a [Earth Day mo.] APR, 57a [Nat. racked by civil war] SYR, 66a [BHO’s signature legislation] ACA, 74a [Obviously offended] IN A SNIT, 76a [Largest union in the U.S.] NEA, 80a [Purporting it to be true] AS FACT, 125a/126a HARNESS/REIN IN. A misfill and a near-misfill: 46a [Buffet patron’s aid] TRAY, not TONG. 75d [It’s a wrap] SARAN, but I was tempted to go with the variant SAREE. 90a [Daughter of Minos] PHAEDRA. If I remember correctly, I solved one of Pawel’s puzzles a month or two ago (perhaps longer), and since I was unfamiliar with his style, the solving time took a little longer. This one is the same! A little tough for an LAT, but a great design with 6 15-letter entries all interlocked like a tic-tac-toe grid. And in typical LAT fashion, all entries are lively and fresh. This was an enjoyable challenge. 4.3 stars. 1A [Spent] JADED – I don’t use JADED in this sense, but the main definition does mean exhausted. 20A [Quantum mechanics symbol] SCHRODINGER’S CAT – This page explains the paradox. Great entry! 24A [“Piece of cake!”] DEAD EASY – Nobody says this in Indiana! 31A [Dramatic start?] MELO – Also, [Nickname for Knick star Anthony]! 37A [Herbie and Christine] SELF-DRIVING CARS – I don’t think Uber wants to use either of these! Great clue and entry! And centrally featured in the grid! 4D [Like the Toyota Prius] ENERGY-EFFICIENT – Another great 15-letter answer! 6D [When Valjean is released from prison] ACT I – Or right at the beginning of Les Miserables, a movie I highly recommend. 9D [Like Halloween pumpkins] IN SEASON – Now that I think of it, most pumpkin flavored stuff IS available in the fall! Tricky clue! 11D [“Oda a Salvador Dali” poet Garcia __ ] LORCA – If you say so! Easily the toughest answer in the puzzle. 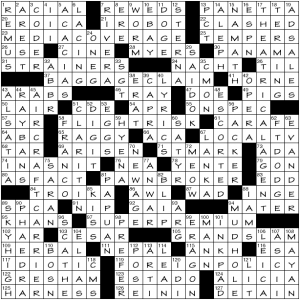 25D [Zaire’s Mobutu __ Seko] SESE – This dude is also crossword famous! 38D [Football plays with special teams] RUNBACKS – As in kickoff and punt returns. The NFL Pro Bowl, as well as a couple of college all-star games, are the only football left besides the Super Bowl next weekend! 49D [Walk __ line] A THIN – Another great entry. A natural, common phrase. Even in Indiana! I’ll stop now! Have a great weekend! As usual, Brad has a toughie for us today. Maybe not the hardest of his I’ve seen, but it’s ups there. I wasn’t able to sit in a quiet spot and do this one, and the timer was wonky so my actual time may be a bit longer than 15 minutes, but let’s just say I learned a new word (phrase) or two! I do still cringe a tad when I see Brad’s byline still, but I enjoy his work! 4.5 stars for this 70-worder. 13A [Clones in a Universal franchise] T-REXES – As in the dinosaurs from the Jurassic Park series of movies! 18A [You should coast through it] GUT COURSE – Like an Easy A? Believe it or not, I have never heard this phrase. I thought we were talking food! 25A [Usher’s niche] R AND B – My mind was in the movie theater for this one! 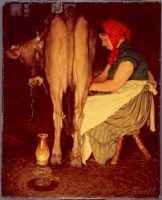 35A [Rockwell subject painted with Daisy the cow] O’LEARY – I have seen this painting before, but it’s been a while. Again, my tired brain pictured Norman Rockwell painting with a cow helping him paint! 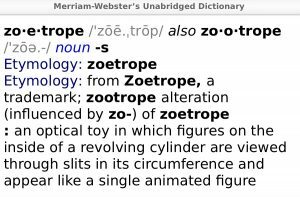 60A [Pre-film animation device] ZOETROPE – Another word that is buried deep in my subconscious. Well done! 1D [Seasoned pro] STAGER – This must refer to one who has “treaded the boards” for years. I assume! 2D [Disney’s sea witch] URSULA – This is from The Little Mermaid, which I believe I have repeatedly mentioned that I have NEVER SEEN! I had to ask my wife who this was! 9D [Onetime Spears partner in McDonald’s commercials] N’SYNC – How long ago was this?! 15D [One of a human quartet] CUSPID – I was racking my brain to figure out what we have four of in our bodies! Heart chambers? Fingers on one hand that aren’t thumbs? Great clue! 44D [Line on interstate trucking invoices] USE TAX – I have certainly seen this on many a packing slip in my day! 45D [With different-color bands, in biology] ZONATE – C’mon, now. This is too hard! That is all for today. Enjoy your football-less weekend! Hello there. Almost every time I come on here, I’m always in some sort of jovial mood. Not today, and I’ll use some of the clues in the grid to show that. As for today’s theme, with the crossword brought to us by Mr. Randolph Ross, the four theme entries end with words that also are elements to basic math equations. Many may not know that I grew up in the Muslim faith, as my whole extended family on my father’s side is Muslim. Not that I needed to have ties to Islam to be as upset as I am right now, but seeing the BIGOT (5D: [Archie Bunker type]) who’s also happens to be Commander in Chief sign the executive order banning Muslims from SYRIA indefinitely and other Muslims from other countries that have a majority of Muslims living inside of their borders for 120 days has caused me to feel rage I haven’t ever felt before…or at least for a long, long time (49D: [Aleppo’s land]). It’s almost impossible to have any CHEER with my tone right now (31D: [All alternative]). Yes, I can absolutely take some solace in the many, many great citizens of this country are OUT right now protesting, including at nearby JFK Airport (59D: [Away]). Seeing some straphangers with signs on the subway on my way to Madison Square Garden made me feel good. I hope to be at JFK as well once I’m done covering this hockey game. “Sports will make you smarter” moment of the day: STAGS (53D: [Bucks]) – Not really in the mood to fill this out now, but do know that the sports teams at Fairfield University in Fairfield, Conn. are known as the STAGS. See you all for the Sunday Challenge. This entry was posted in Daily Puzzles and tagged Brad Wilber, Damon Gulczynski, Pawel Fludzinski, Randolph Ross. Bookmark the permalink. If anybody is interested in extended constructor comments for today’s NYT, please visit my blog: scrabbledamon.blogspot.com. And I also recommend Puzzles for Progress — good causes, good puzzles. I’ve recently started making my way through them myself. NYT: The name Tottenham Hotspur is actually derived from Harry Hotspur, whose descendants owned land in the part of London where the club originated. Easy for a Saturday. The only unfamiliar word for me was TRIOLET, and I got held up at the end because I had to run the alphabet to find the STRA_S/AFE_ cross. D’oh! I’d always thought of the ACURA logo as just an artful distortion of the Honda ‘H’ — so that’s a nice little item of trivia to store away. LAT: Derek, I thought this puzzle was really hard and that “Lorca” was the easiest answer! I guess I’m an outlier today, because I found the NYT hard and the LAT rather easy. 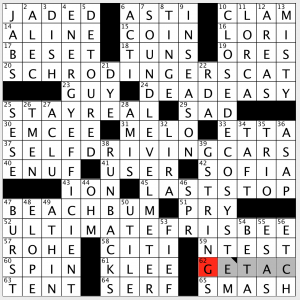 The LAT grid-spanners fell with very few letters in place (SCHRODINGER’S CAT was the toughest), while the NYT entries that were gimmes for others were anything but that for me. Spike Lee movies? Not in my wheelhouse, although GAME gave me enough to pull it out of memory (thank you, Roanoke Island). I knew Bell was a Bronte, but which one and which book? Nope. PERONI? Never heard of it. Thank goodness for BOSCH and KIR or the NW would have totally screwed me. All in all, a very enjoyable puzzle. Liked the LAT as well; just not quite as much. Thought the WSJ was rather blah. Same initials for their male-ish pseudonyms and real names. I may be dating myself by remembering this, but “Blaze of Glory” was by Jon Bon Jovi, not the band. I can never keep the Brontes straight either, but coming up with that book title was not hard. Indeed, EYRE alone is common fill (but it’s a great novel anyway). My last to fall was the SW and last entry was A FEW, which I liked, as in fact I liked the whole puzzle. The most puzzling for me was CRAZE. The clue sounded like I needed CRAZY, an adjective.